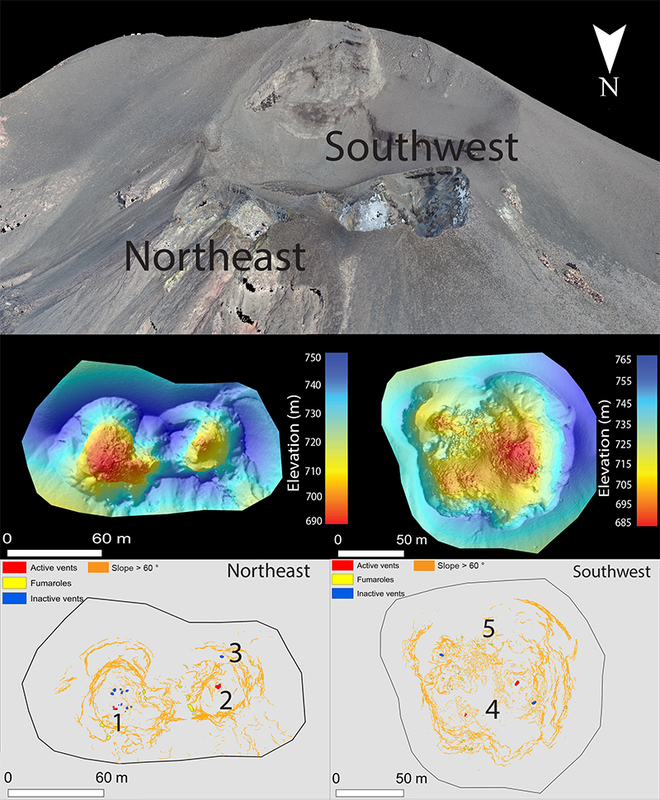 Geyer’s team modeled an eruption on Deception Island by simulating different column heights for volcanic ash: 5, 10, and 15 kilometers. (Indonesia’s Mount Agung, when it erupted last month, sent ash billowing up 9 kilometers.) The height of the plume determines which wind patterns it encounters, which, in turn, affects its dispersal. The researchers used an atmospheric transport model to track the way ash would disperse on regional and global scales and assess its possible effect on air travel. Airborne ash is a serious problem for aircraft because it melts inside of engines and gums up fuel lines. And it doesn’t show up on radar. There have been hundreds of reported incidents of aircraft encountering volcanic ash, including the 1989 case of KLM flight 867, which lost power in all four engines and fell more than 13,000 feet after flying through an ash cloud from Alaska’s Redoubt Volcano. (The pilots managed to restart the engines, and the plane landed safely in Anchorage.) When Iceland’s Eyjafjallajökull erupted in 2010, its ash clouds prompted officials to close airspace across Europe, resulting in economic losses estimated to be billions of dollars. For large eruptions on Deception Island, ash would be prevalent on global scales, the team concludes this week in Scientific Reports. Ash spewed high up into the stratosphere would encounter strong winds whipping around the South Pole. These circular winds—known as the polar vortex—move at speeds up to 60 meters per second and can send ash swirling far from its source. The team found that dangerous levels of airborne ash—exceeding flight safety thresholds of 2 milligrams per cubic meter—persisted thousands of kilometers from Deception Island, rendering routes toward major airports such as Buenos Aires unsafe for flying. But even ash that wasn’t lofted as high still tended to disperse widely, the team found. That’s because ash injected into a lower layer of the atmosphere known as a troposphere encountered chaotic, meandering atmospheric waves that carried it as far away as South America, Australia, and Africa. The researchers also tested moving the site of the eruption to Mount Erebus, another active Antarctic volcano located at a latitude of –77° near McMurdo Station, the largest research base in Antarctica. They found that higher plumes still resulted in transcontinental ash dispersal, but ash from lower plumes—generally less than 10 kilometers—tended to remain confined near the South Pole because of the less-intense, low-elevation winds at high latitudes. The high viscosity magma of stratovolcanoes like Agung makes them extremely explosive—and potentially deadly. Bali authorities have issued evacuation orders for 100,000 people living within a six-mile radius of volcanic Mount Agung, the highest point on the Indonesian island. Trouble has been brewing at the volcano for quite some time. Researchers recorded seismic activity at Agung beginning in August, with the unrest increasing in the following weeks, according to the Earth Observatory of Singapore. On September 22, authorities raised to the volcano’s status to level 4, its highest warning category. Then, last Tuesday the volcano began emitting plumes of smoke and mudflows streamed through local waterways. 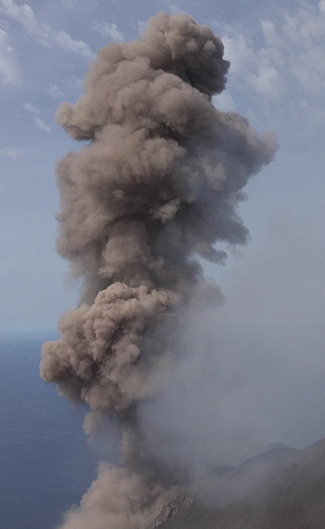 Over the weekend, the ash cloud reached 30,000 feet and magmatic eruptions began, reports the Associated Press. About 59,000 travelers are currently stuck on the island after the ash caused the international airport to close. While authorities tell the AP they don’t expect a major eruption, the activity changed early this morning from emission of steam to magma. So officials are playing it safe. 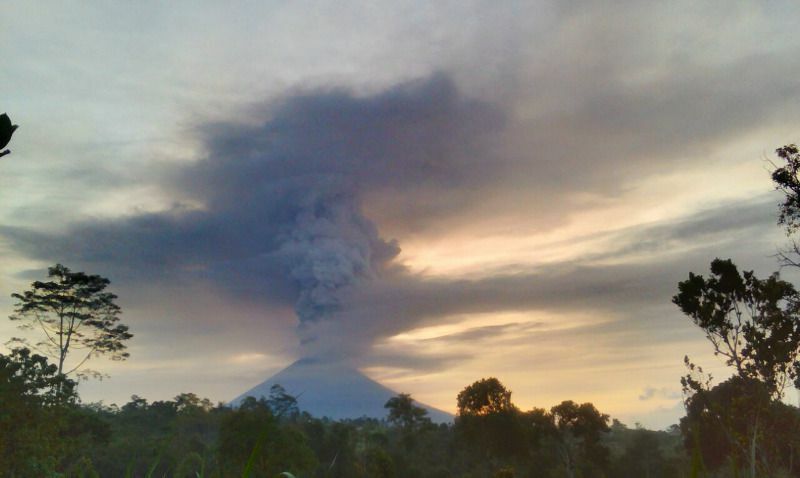 Last time Agung erupted in 1963, an estimated 1,100 people died. And since the 1963 catastrophe, population density has only intensified on Agung’s slopes. So what makes Agung so dangerous? Blame its geology. Agung is what’s known as a stratovolcano. Also known as composite volcanoes, these formations occur at tectonic subduction zones, areas where two tectonic plates meet and one plate slides underneath another, geophysicist Jacqueline Salzer at the German Research Centre for Geosciences tells Fabian Schmidt at Deutsche Welle. The lava in those areas is usually thick and sticky, causing pressures to build within the steep cones, which results in highly explosive—and deadly—eruptions. As Janine Krippner, a volcanologist at the University of Pittsburgh, writes for the BBC, Agung has gone through the predictable stages of a waking volcano. In August, small earthquakes were measured, but the mountain appeared unchanged. Then, in September, as rising magma heated the interior of the cone, plumes of steam were observed as the water in the mountain heated up. Beginning last week, steam-driven or phreatic eruptions began. During this time, steam inside the volcano built up pressure causing small explosions to shoot ash, crystals and rock into the air. Now the magma has reached the surface—the point at which it is called lava—and its glow can be seen at the top of the mountain. Authorities are hopeful the eruption won’t continue further but if it does, several types of disasters could unfold. 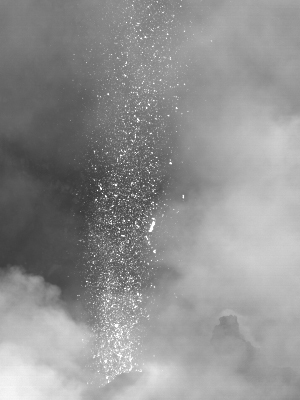 The cloud of gas and steam will blow off larger pieces of the mountain off, shooting rock “bombs” into the air. Actual lava flows could also stream down the mountain for several miles. But the most dangerous element of the eruption is the pyroclastic flow, an explosion of hot gas and debris that follows valleys or low-lying areas. These flows can race down the mountain at 50 miles per hour, destroying everything in its path. Another major concern is lahars which occur when volcanic debris and ash mixes with water, creating a slurry the consistency of wet concrete. Lahars can rush down slopes at up to 120 miles per hour and swell in volume, destroying any villages or structures in its path. According to John Seach at VolcanoLive, during the 1963 Agung eruption, 820 people were killed by pyroclastic flows, 163 died from falling ash and rock and 165 were killed by lahars. The 1963 eruption also had global consequences. Alle McMahon at the Australia Broadcasting Corporation reports that the sulphur dioxide blown into the atmosphere by that event temporarily cooled the Earth by 0.1-0.4 degrees Celsius by reflecting some of the sun’s ultraviolet radiation. If Agung does have another major eruption, this miniscule amount of cooling is likely too small to be noticed. But the immediate consequences of such an eruption can be deadly, so authorities are encouraging locals to heed the evacuation notices. Italy’s Solfatara crater lies in the Phlegraean Fields caldera, near Mount Vesuvius, the volcano that buried the city of Pompeii in 79 CE. The Phlegraean Fields caldera is located inside the metropolitan area of Naples, and it is one of the largest volcanic systems on Earth. This caldera is currently showing significant volcanic unrest, mainly located around the Solfatara volcano. The crater’s boiling, sulfurous mud pools and fumaroles indicate an intense volcanic activity, which many scientists view as a serious potential threat to the roughly 3 million inhabitants of this region. Scientists have long struggled to track Solfatara’s activity because the interactions between the gases in magma, water, and steam within volcanoes are still poorly understood. Now, however, a 3-D map of the complex water and gas-bearing tunnels and chambers within the caldera could aid that effort. 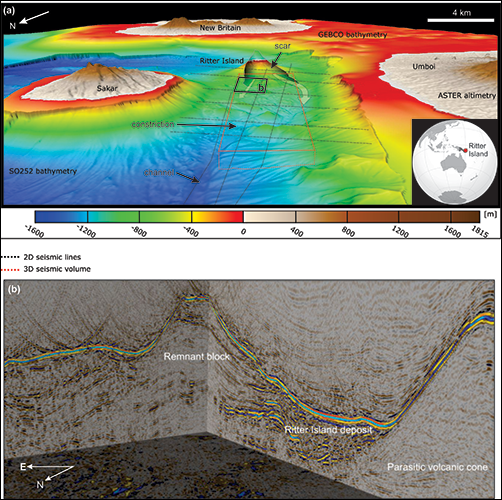 Gresse et al [Journal of Geophysical Research]. used electrical resistivity tomography (ERT), a technique commonly used to study aquifers and other underground structures, to map the structure of Solfatara’s inner cracks and chambers. In ERT, researchers induce an electrical current between multiple electrodes placed on the ground and then collect profiles of the resistance it encounters as it passes through substances such as water, rock, mud, or gas. After doing this repeatedly, they can compile a 3-D picture of what lies below. This study reveals, for the first time, the structure of a gas-filled reservoir 50 meters below the surface of the Solfatara caldera. It shows that the reservoir is attached to a 10-meter-thick channel that turns into an opening known as the Bocca Grande fumarole, a vent through which foul-smelling volcanic gases escape to the surface. 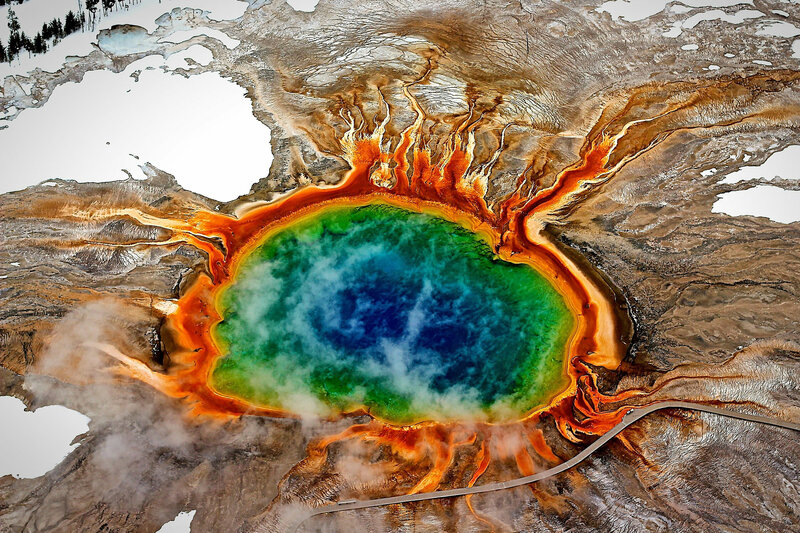 It also reveals the hidden condensate water channels beneath the surface, as well as the precise dimensions of features such as the cryptodome, a body of magma that can make the surface of a volcano bulge without erupting. Solfatara releases thousands of tons of hot carbon dioxide and water through vents such as the Bocca Grande fumarole every day. 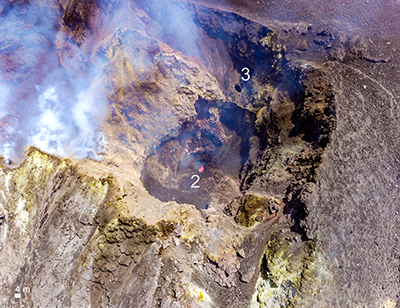 As pressure within the volcano builds over time, the ground above often rises and can cut off or change the shape of these internal release valves. Although the Phlegraean Fields caldera hasn’t erupted since 1538 CE, three ground uplift events have occurred since the 1950s, suggesting to some that the next eruption could be coming soon. At least it’s easier to pronounce than Eyjafjallajökull. Earthquake rumbles under the Vatnajökull glacier in Iceland could be signs of an impending eruption by the country’s biggest volcano. Bárðarbunga, which stands 2,009 metres (6,591 ft) above sea level, is one of a number of volcanoes that geologists are carefully monitoring after a spate of recent earthquake activity – indicating that the pressure in the volcano is increasing. Bárðarbunga. Pictures taken by Peter Hartree between 14.30 and 15.00 on September 4th 2014. “The reason for the earthquakes in this place is that the volcano Bárðarbunga is inflating, i.e. the pressure of magma in the magma chamber is increasing,” volcano expert Páll Einarsson at the University of Iceland told the Daily Star. Bárðarbunga has been rumbling, he said, since February 2015 – when the volcano’s last eruption, beginning August 2014, ended. Prior to that event, the volcano had been causing earthquakes with increasing frequency since 2007 – and the eruption itself was preceded by a swarm of 1,600 eruptions within 48 hours. 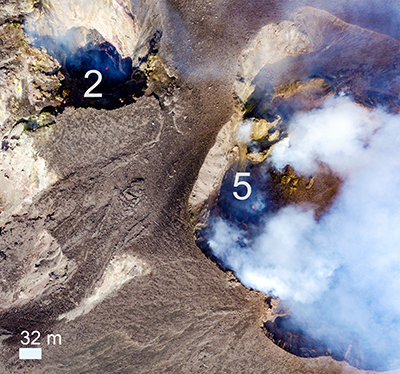 The 2014-2015 eruption of Bárðarbunga was relatively light in consequences compared to the earlier 2010 eruption of the smaller Eyjafjallajökull. A subglacial stratovolcano, Eyjafjallajökull’s modest-sized eruption caused unusual and disproportionate havoc. The heat of the volcano melted the ice cap, which caused floods. Then it spewed ash several kilometres into the atmosphere – where it was carried thousands of kilometres over Europe by the jet stream above. So thick and far-reaching was the ash that air travel all over Europe was disrupted for weeks after the eruption. Bárðarbunga is also a subglacial stratovolcano, and although a repeat of Eyjafjallajökull’s havoc is possible, it’s unlikely – as demonstrated by the volcano’s 2014-15 eruption. There are other rumblings in Iceland too – earlier this year, Einarsson told the Iceland Monitor that four volcanoes were on the path to eruption sometime in the next few years. The other three are Grímsvötn, Hekla, and Katla – the latter of which is considered the most dangerous volcano in Iceland. But the world has also been waiting on an eruption from Katla for decades. Mauna Loa is showing persistent signs of volcanic unrest. Since 2014, increased seismicity and deformation indicate that Mauna Loa, the volcano that dominates more than half of the island of Hawaiʻi, may be building toward its first eruption since 1984. Thousands of residents and key infrastructure are potentially at risk from lava flows, so a critical question is whether the volcano will follow patterns of previous eruptions or return to its now historically unprecedented 33-year slumber. Mauna Loa has erupted 33 times since 1843, an average of one eruption every 5 years [Trusdell, 2012]. Typical of shield-building Hawaiian volcanoes, Mauna Loa hosts a summit caldera and two rift zones, the Northeast Rift Zone (NERZ) and the Southwest Rift Zone (SWRZ; Figure 1, inset). Since the two most recent eruptions, in 1975 and 1984, monitoring by the U.S. Geological Survey’s Hawaiian Volcano Observatory has changed dramatically. Ground-based instruments continuously record signals from global navigation satellite systems (GNSS, of which GPS is one example), measuring the changing shape of the ground surface in near-real time, and interferometric synthetic aperture radar (InSAR) provides extensive spatial coverage of deformation. Seismic monitoring has also improved with the addition of more stations, increased data fidelity, and improved data analysis. More people live on the slopes of Mauna Loa now than in the 1970s and 1980s, so improvements in monitoring technology are of more than just academic interest. How does this recent period of unrest compare with the periods just before previous eruptions? How reliable are these comparisons in predicting the next eruption? Fig. 1. The Italian satellite system COSMO-SkyMed acquired radar images of Mauna Loa on 1 January 2013 and 30 April 2017 to produce this ascending mode interferogram. Each fringe represents 1.5 centimeters of motion in the line-of-sight direction to the satellite. The butterfly pattern of fringes suggests an inflating tabular body beneath the caldera and uppermost Southwest Rift Zone (see inset map). The sizes of the white dots represent the magnitudes of earthquakes that occurred during this period. The arrow at the bottom left shows the direction of the satellite’s motion. The satellite’s interferometric synthetic aperture radar (InSAR) antenna looks to the right of the satellite track, and the radar contacts the land surface at about 35° off vertical. The inset is a digital elevation map of Mauna Loa showing lava flows since 1843 in red. The box shows the approximate extent of the interferogram image. COSMO-SkyMed data were provided by the Agenzia Spaziale Italiana via the Hawaiʻi Supersite. 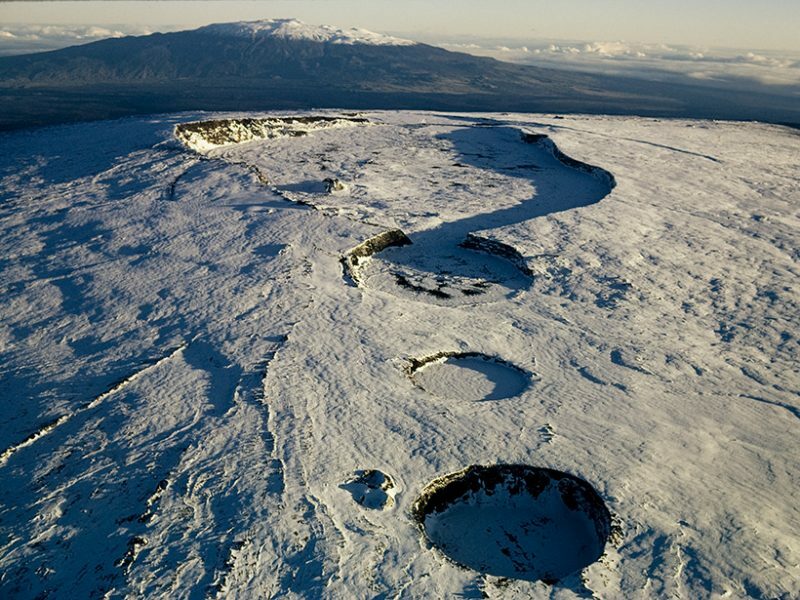 Several periods of unrest have occurred at Mauna Loa since the 1984 eruption. The shallow magma storage complex started refilling (inflating) immediately following the eruption, but inflation soon slowed, and stopped altogether in the mid-1990s (Figure 2). A short-lived inflation episode began in 2002 [Miklius and Cervelli, 2003], and another began in 2004. By 2009, inflation had largely ceased. Unlike the current unrest, these previous two inflation episodes were not associated with significant numbers of shallow earthquakes; rather, they started with brief periods of deep seismicity approximately 45 kilometers beneath the surface [Okubo and Wolfe, 2008]. The current unrest started in earnest in 2014 (Figure 2). Seismicity rates began to rise above background levels as early as March 2013, and by summer 2014, both seismicity and deformation rates had increased significantly. The pattern of ground deformation indicated inflation of a magma storage complex beneath the caldera and uppermost SWRZ, areas that were also the most seismically active (Figure 3). Beneath the caldera, seismicity consists of mostly small earthquakes (magnitude M of less than 2.5) at depths of 2–3 kilometers. These earthquakes occur in swarms lasting days to weeks, separated by months of minor activity. Event rates have been as high as 15 earthquakes per hour, with most earthquakes too small to be formally located. Fig. 3. Blue arrows (with gray 95% confidence error ellipses) show the average horizontal velocities of GNSS stations on Mauna Loa from mid-2014 through 2016. Red arrows represent velocities predicted by a model of a horizontally opening tabular body extending from about 3 to 6 kilometers beneath the summit and upper Southwest Rift Zone and a radially expanding body at about 3 kilometers beneath the southeastern wall of the caldera. The surface projections of these magma reservoirs are indicated by the black line and black circle. The average rate of magma accumulation in these shallow reservoirs is on the order of 13 million cubic meters per year. The uppermost SWRZ has been the most seismically active region during the current unrest, in terms of overall energy release and number of earthquakes. These earthquakes are typically 3–4 kilometers below the surface. Another area of seismicity has been high on the west flank of the volcano, where swarms of small earthquakes (mostly less than M2.5) at an average depth of about 7 kilometers typically last days to a week. In addition to shallow seismicity, there have been several deep (greater than 20 kilometers), long-period earthquakes loosely scattered beneath the summit area. During previous periods of inflation, earthquakes with similar characteristics have been associated with magma ascent [Okubo and Wolfe, 2008]. Short-term rates of seismicity and deformation have varied in magnitude, with weeklong to monthlong periods of relative quiescence interspersed within longer-term trends of heightened activity. Although there is general long-term correlation between deformation and seismicity rates, there is no obvious relationship between them in the short term. The spatial pattern of deformation and seismicity has also varied. In fall 2015, after several months of decreased inflation at the summit, seismicity beneath the caldera largely ceased, and inflation in the upper SWRZ increased (Figure 4). 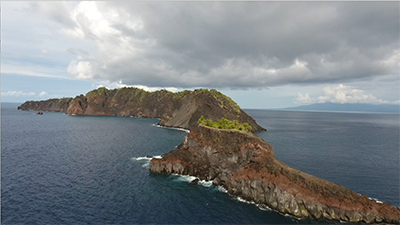 In May 2016, inflation and seismicity beneath the caldera slowly resumed, but as of mid-2017, rates are low compared with those seen prior to fall 2015. Fig. 4. COSMO-SkyMed ascending mode interferograms show the shift in locus of inflation toward the upper Southwest Rift Zone in October 2015. Each image covers about the same length of time: (left) 18 March 2015 to 9 August 2015 and (right) 24 July 2015 to 31 December 2015. Each full-color cycle represents 1.5 centimeters of motion in the line-of-sight direction toward the satellite. Arrow shows direction of motion of the satellite. The SAR antenna looks to the right of the satellite track; the incidence angle is about 35° off vertical. COSMO-SkyMed data were provided by the Agenzia Spaziale Italiana via the Hawaii Supersite. Deformation monitoring networks in place before the 1975 and 1984 eruptions were sufficient to provide long-term indications of inflation that along with increased seismicity, led to a general forecast for the 1984 eruption [Decker et al., 1983]. 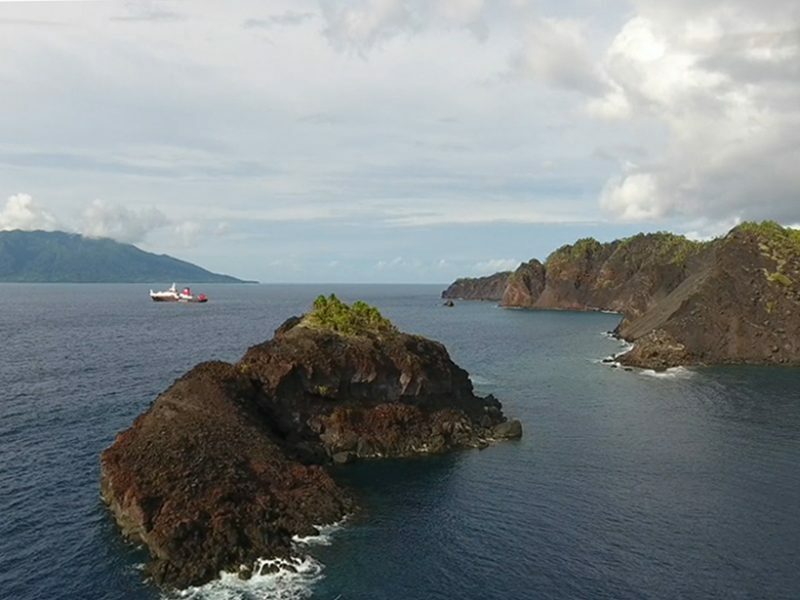 However, measurements were not frequent enough to evaluate whether there were precursory changes in extension or uplift in the summit area just prior to eruption. Direct comparison of magma storage geometries and volumes derived from deformation patterns is also not possible because of the limited spatial and temporal extent of the early geodetic monitoring networks. 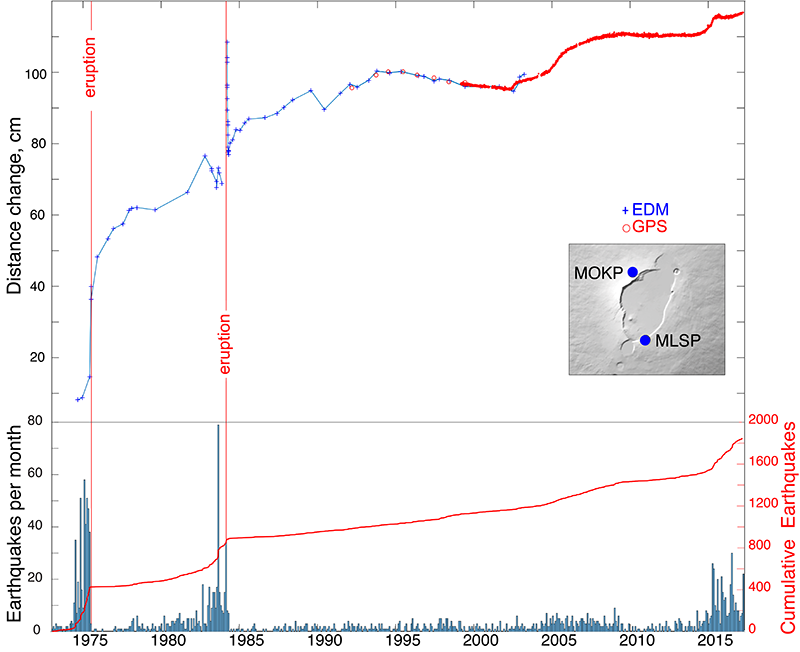 Pre-1984 measurements are consistent with, but cannot confirm, the existence of a large-volume tabular storage complex (a vertical, dikelike body) beneath the summit and upper SWRZ, similar to what we currently model from GNSS and InSAR data. Similarly, differences in seismic network sensitivity and data processing preclude direct comparison of current seismicity rates with pre-1975 and pre-1984 rates. Patterns in the locations of earthquakes stronger than about M1.7, however, are comparable, and these patterns show a clear coincidence between the locations of seismicity during the current unrest and previous preeruption patterns (Figure 5). Another approach to comparing precursory seismicity is to evaluate cumulative seismic energy release, which mainly reflects energy released by larger-magnitude earthquakes (energy release increases logarithmically with respect to earthquake magnitude). Between 1 May 2013 and 30 April 2017, energy release on the west flank was equivalent to an M4.1 earthquake. For the same region, energy releases during the 4 years prior to the 1975 and 1984 eruptions were M4.2 and M4.5, respectively. In the caldera and uppermost SWRZ, the current energy release sums to M4.4, compared with M4.9 and M4.4 for the 1975 and 1984 precursory periods. Thus, the energy released during the current 4 or so years of unrest is approaching that released during the 4 years prior to the 1975 and 1984 eruptions. In some volcanic systems, the amount of energy release compared with previous eruptions may be an indicator of whether a period of unrest results in an eruption [Thelen et al., 2010], but this relationship has not been established on shield volcanoes such as Mauna Loa. One to 2 years prior to the 1975 and 1984 eruptions, swarms of small earthquakes increased in intensity. The strongest swarms included hundreds of small earthquakes per day for weeks. Bursts, as they were called, were separated by 3–6 months of relative quiet [Koyanagi et al., 1975]. Recently, swarms on the west flank have increased in number and size, but the durations of the swarms are less than pre-1975 and 1984 levels. Similarly, swarms of tiny earthquakes beneath the caldera have not occurred at rates seen in the months prior to the 1975 and 1984 eruptions. Interestingly, during the days to weeks prior to the past two eruptions, the number of small earthquakes fluctuated instead of building up steadily, even reaching relatively low rates for short periods prior to eruption [Koyanagi, 1987; Lockwood et al., 1987]. However, both eruptions had distinct short-term seismic precursors. The 1975 eruption was preceded by less than an hour of strong tremor in the summit caldera area [Lockwood et al., 1987]. In 1984, small (less than M0.1) earthquakes increased in frequency, shaking the ground two or three times per minute about 2.5 hours before the eruption [Koyanagi, 1987]. Harmonic tremor began about 2 hours prior to eruption, with a large increase in tremor amplitude and a swarm of earthquakes 30 minutes prior to eruption. Seven earthquakes larger than M3 occurred during a period from 30 minutes before the 1984 eruption until just over 1 hour after the onset of the eruption. Fig. 5. Earthquake epicenters for (a) the 4 years prior to the 1975 eruption, (b) the 4 years prior to the 1984 eruption, and (c) the latest 4 years of unrest (1 May 2013 to 30 April 2017). Earthquake symbol size is based on magnitude, and color is based on depth. Only earthquakes above M1.7 are included, in an attempt to compensate for differences in network sensitivity since 1975. All earthquakes are analyst reviewed. Because the analysis of earthquakes above M1.7 is only partially complete for the current episode of unrest, event rates since 2013 may actually be slightly higher than shown here. Is an Eruption in Our Near Future? Mauna Loa’s long history of observed activity aids in forecasting another eruption, but at present, any forecast still contains a high degree of uncertainty. Some aspects of the current unrest are similar to unrest prior to eruptions in 1975 and 1984. 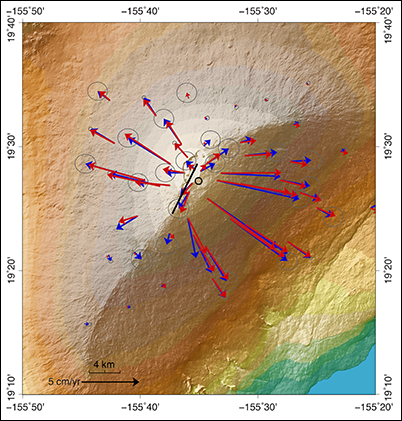 Earthquake locations, temporal behavior, and energy release suggest that the volcano may be following a similar pattern. Other aspects, however, differ from the periods prior to the 1975 and 1984 eruptions. During the current unrest period, we have not observed the kind of moderate to large flank earthquakes that preceded many historical eruptions [Walter and Amelung, 2006], including the 1975 and 1984 eruptions. Also, as of fall 2017, we have not seen the high rates of small earthquakes observed about 7–14 months prior to the 1975 and 1984 eruptions, even though our ability to detect them has improved. Thus, if current unrest follows previous patterns of seismicity, we may expect that the volcano is still many months from eruption. We must also consider that current unrest might not follow previous patterns, and an eruption could occur without months of elevated microseismicity. It is possible that after years of intermittent inflation, shallow magma storage is exerting pressures already near the breaking point of the overlying rock. We can’t say for certain whether there will be a precursory months-long increase in microseismicity before the next Mauna Loa eruption. However, an eruption will likely be immediately preceded by an hours-long, dramatic increase in small earthquakes (at least one earthquake per minute), strong tremor, and the occurrence of several M3 or stronger earthquakes, similar to the lead-up to the 1975 and 1984 eruptions. Real-time deformation data from tiltmeters and GNSS stations will show large anomalies as magma moves from storage reservoirs toward the surface to the eventual eruption site in the summit area and/or along one of the rift zones or (less likely) from radial vents on the west flank. It is also possible that current elevated rates of seismicity and deformation may not culminate in eruption anytime soon; rather, this could be yet another episode of unrest that gradually diminishes. During the 25-year repose between the 1950 and 1975 eruptions, seismic unrest in 1962, 1967, and 1970 did not lead to eruption, although in hindsight, each is considered a long-term precursor to the 1975 eruption [Koyanagi et al., 1975]. The high rate of volcanic activity at neighboring Kīlauea volcano complicates assessing the likelihood of a Mauna Loa eruption in the coming months or years. Klein  noted that longer repose intervals at Mauna Loa were statistically correlated with eruptive activity at Kīlauea. Indeed, the current long repose time at Mauna Loa is occurring at the same time as the long-lived Puʻu ʻŌʻō eruption at Kīlauea, which began in 1983 and continues today. Even so, the most recent eruption of Mauna Loa in 1984 occurred during this eruption at Kīlauea, so the impact of nearby volcanic activity on Mauna Loa’s behavior over short timescales is unknown. We can make one forecast with relative certainty: On the basis of nearly 200 years of documented activity, it is highly likely that the next eruption will begin in the summit region and then, within days to years, migrate into one of the two primary rift zones [Lockwood et al., 1987]. It is important to note that seismicity and inflation beneath the uppermost SWRZ do not imply an increased likelihood of eruption along the SWRZ. Similar patterns of seismicity prior to the 1975 and 1984 eruptions did not result in sustained activity in the SWRZ. In 1984, the eruption began at the summit and migrated to the upper SWRZ before activity focused along the NERZ, suggesting that a magma body extending into the uppermost SWRZ—similar to that inferred from current data—was also active prior to that eruption. In response to more than a year of persistently elevated rates of seismicity and deformation, the Hawaiian Volcano Observatory (HVO) elevated the Volcano Alert Level and Aviation Color Code for Mauna Loa to advisory/yellow on 17 September 2015, indicating that the volcano was restless and that monitoring parameters were above the long-term background levels. Since then, HVO has continued public education efforts and engaged agency partners, including Hawaiʻi County Civil Defense and the National Park Service, to discuss preparedness and response planning. In 2016, HVO installed new web cameras and upgraded real-time gas and temperature sensors in the summit caldera. Alarms have been set to alert scientists to significant changes in several data streams, including real-time seismic amplitude (a measure of seismic energy release), ground tilt, and satellite- and ground-based thermal imagery. Revised maps showing potential inundation zones and likely lava flow paths based on topography derived from digital elevation maps have been prepared. 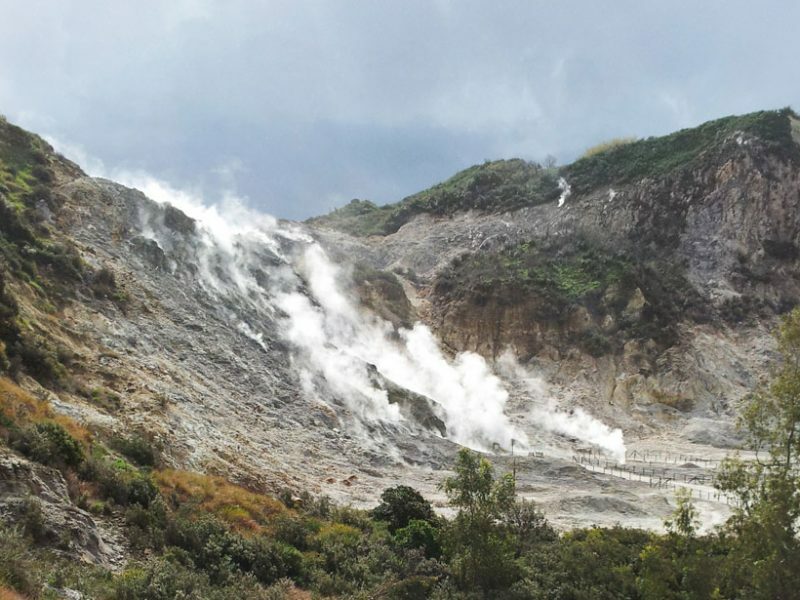 As with any precursory volcanic eruption sequence, it will be challenging to choose the correct time to alert authorities and elevate public concern about a possible eruption. 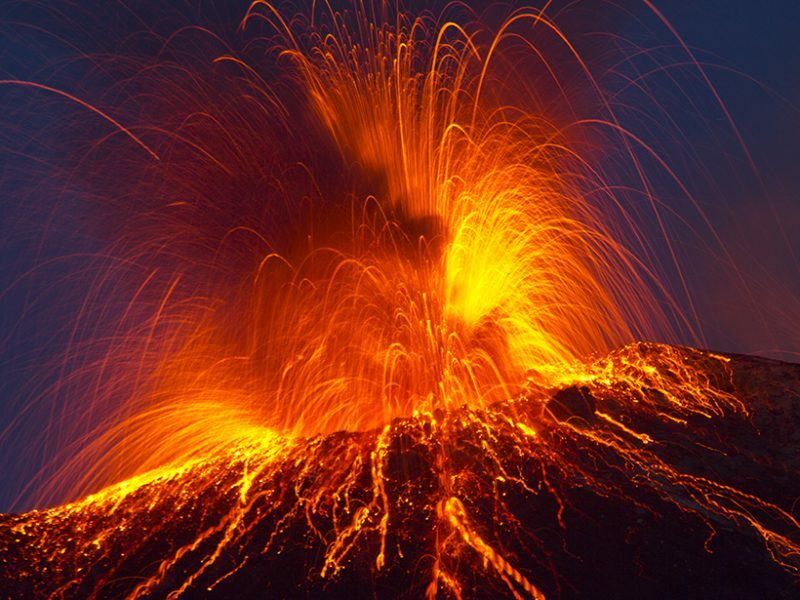 Once an eruption has commenced, pinpointing the exact location of the outbreak—especially at night or in cloudy conditions—may not be straightforward and may require the use of new tools such as infrasound. Vent location determines which downslope areas are at greatest risk, so addressing this capability gap is a high priority. As of this writing, elevated rates of seismicity and deformation continue. Improvements in monitoring networks and alarming systems since 1984 put HVO in a better position to provide early warning and, once an eruption has commenced, help guide emergency response. Additional efforts to inform and prepare the public for the eventual eruption are an important step in minimizing impacts to life and property. Decker, R. W., et al. (1983), Seismicity and surface deformation of Mauna Loa volcano, Hawaii, Eos Trans. AGU, 64(37), 545–547, https://doi.org/10.1029/EO064i037p00545-01. Klein, F. W. (1982), Patterns of historical eruptions at Hawaiian volcanoes, J. Volcanol. Geotherm. Res., 12, 1–35, https://doi.org/10.1016/0377-0273(82)90002-6. Koyanagi, R. Y. (1987), Seismicity associated with volcanism in Hawaii: Application to the 1984 eruption of Mauna Loa volcano, U.S. Geol. Surv. Open File Rep., 87-277, 76 pp. Koyanagi, R. Y., E. T. Endo, and J. S. Ebisu (1975), Reawakening of Mauna Loa volcano, Hawaii: A preliminary evaluation of seismic evidence, Geophys. Res. Lett., 2(9), 405–408, https://doi.org/10.1029/GL002i009p00405. Lockwood, J. P., et al. (1987), Mauna Loa 1974–1984: A decade of intrusive and extrusive activity, in Volcanism in Hawaii, chap. 19, U.S. Geol. Surv. Prof. Pap., 1350, 537–570. 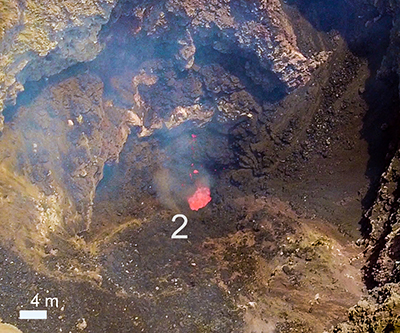 Miklius, A., and P. Cervelli (2003), Interaction between Kīlauea and Mauna Loa, Nature, 421, 229, https://doi.org/10.1038/421229a. 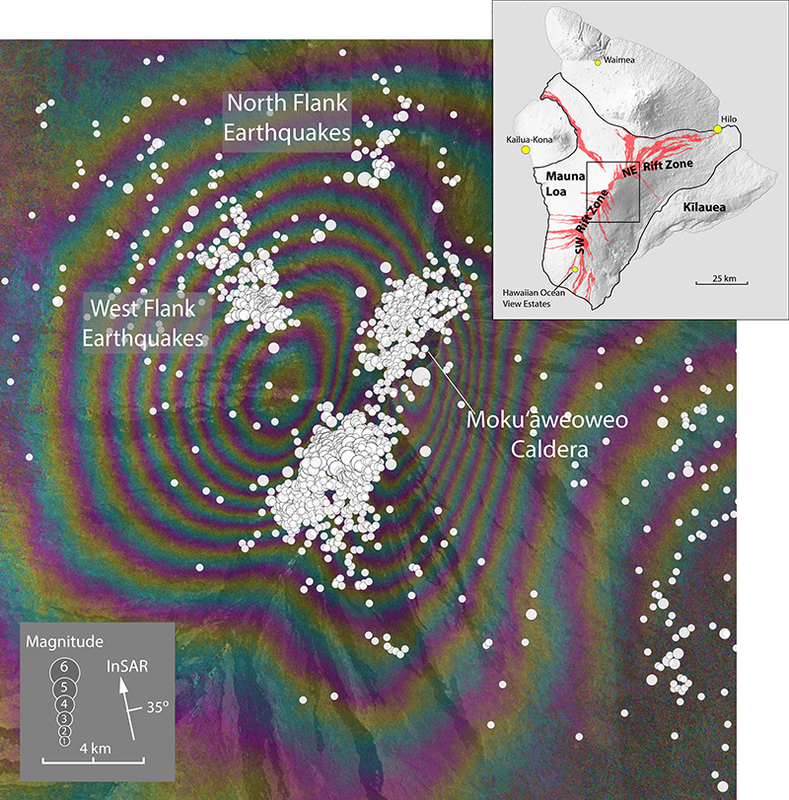 Okubo, P. G., and C. J. Wolfe (2008), Swarms of similar long-period earthquakes in the mantle beneath Mauna Loa volcano, J. Volcanol. Geotherm. Res., 178, 787–794, https://doi.org/10.1016/j.jvolgeores.2008.09.007. Thelen, W. A., S. D. Malone, and M. E. West (2010), Repose time and cumulative moment magnitude: A new tool for forecasting eruptions?, Geophys. Res. Lett., 37, L18301, https://doi.org/10.1029/2010GL044194. Trusdell, F. A. (2012), Mauna Loa—History, hazards, and risk of living with the world’s largest volcano, U.S. Geol. Surv. Fact Sheet, 2012-3104, 4 pp., https://pubs.usgs.gov/fs/2012/3104/. Walter, T. R., and F. Amelung (2006), Volcano-earthquake interaction at Mauna Loa volcano, Hawaii, J. Geophys. Res., 111, B05204, https://doi.org/10.1029/2005JB003861. Death records show scientists and tourists at risk of death in eruptions. A village destroyed by pyroclastic density currents in the 2010 eruption of Merapi, Indonesia. Over 350 people lost their lives, but successful evacuations saved many thousands. Susanna Jenkins.